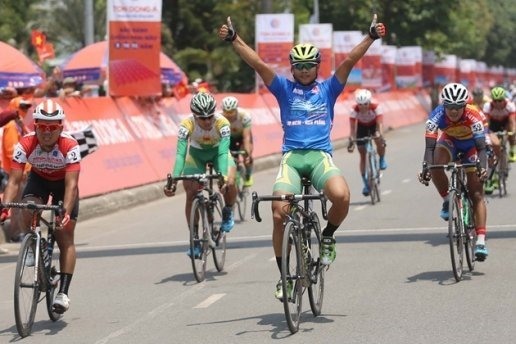 HÀ NỘI — Lê Nguyệt Minh of HCM City won the 10th stage of the HCM City Television Cycling Tournament yesterday. Minh won the 88km stage from Ba Tơ District to Quảng Ngãi City in a time of 2:30.08. It was a short race so many cyclists were in with a chance of winning, however, Minh sprinted the last kilometres to take the victory. Lê Văn Duẩn of VUS-TP.HCM and Nguyễn Tấn Hoài of Domesco Pharmacy Đồng Tháp were the runners-up. Minh holds the green jersey as the best sprinter with 60 points, followed by Hoài with 52 points and Huỳnh Thanh Tùng of the Military Zone 7 with 47 points. Although not finishing in top three of this stage, Nguyễn Văn Dương of Bike Life ĐN still kept the yellow jersey for best overall time of 20.00.37 after 10 stages. Military Zone 7 top the team rankings with the best overall time of 66:08.43. Domesco Pharmacy Đồng Tháp and Bike Life ĐN are second and third, respectively.